As many of you know I adopted Kodiak from TOTTSHR on July 14, 2001. 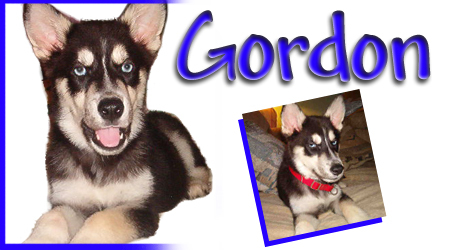 I adopted Kaya from a owner surrender situation here in Maryland and now I AM ADOPTING GORDON from TOTTSHR. He will join my other two (hence the potato chip syndrome). I am also failing fostering 101 my first time out. Many of you realized from day one that I was doomed to fail. I don't know why I decided to foster that day but I feel fate brought Gordon into my home and I have come to realize that there is no possible way I can let him go. His new name will be Klondike, but for now we are calling him Klondike Gordy, for now. So please welcome Klondike Gordy into his forever home where he will become a foster failure, potato chip and TOTTSHR alumni!